A few days after taking delivery of the new carburettor, I visited John to drop it off along with a NOS condenser, thinking that it was still an ignition problem. I left it a few weeks before getting in touch. 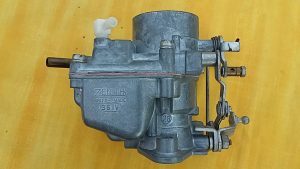 A cursory phone call at the beginning of August, I soon found out the new carburettor was fitted very soon after I delivered it and the car now tuned up much more easily as the mixture screw worked. It was then taken for a test drive and all was going well, pulling strongly and going like a dream (apparently) until it broke down. John got the Corsair going again but was running very badly, much like it probably was for me, and limped it back to his workshop. The investigation then began into fuel delivery. Two problems arose. The new Huco fuel pump I bought back in January was installed wrong – I didn’t understand why it said ‘Top’ on the top of the pump, but it was meant for the horizontal installation. Secondly, the pump could have been too high pressure (only rated at 1.5psi) for the carburettor to deal with and stop the flow of fuel. The pump was meant for SU Carburettors on MGs. This extra pressure and near constant fuel delivery was causing the carburettor to flood and send too much fuel in to the inlet manifold as well as out through the over flow to the fuel tank return pipe. As a result petrol was found with the oil in the sump so was drained off. That means the bores have had something of a petrol wash, hopefully without any devastating effects but it might have given the engine internals something of an impromptu clean (Not Advised in this way!). In discussion with John, for the original electric fuel pump set up, it could have been that the float levels may have been altered to compensate for this, as the fuel is fed to a float bowl/chamber in the carburettor and the floats couldn’t shut off the fuel delivery very well. 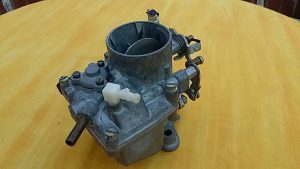 When I stripped the carburettor down a couple of summers ago, I reset or adjusted the float levels back to the factory settings as well as double checking them back in January this year. 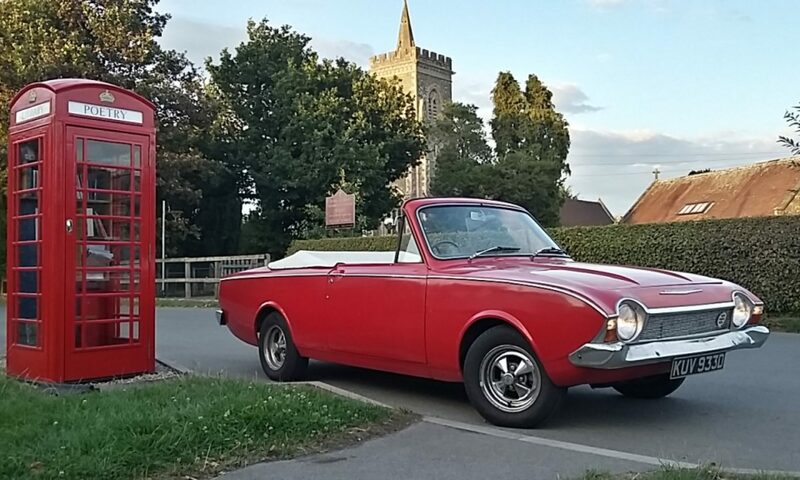 So the next step is to remove the electric fuel pump and revert to fitting a re-manufactured new manual fuel pump that I bought on line from Tickover, formerly a Ford Capri Specialist who now have diverged in to supplying parts for retro Fords. John demonstrated the fault with the original fuel pump as to why it was by passed with an electric pump. That is where we are with the Corsair – hopeful that another running problem will be solved and that I may get to drive it in the latter stages of this balmy summer we’ve been having.